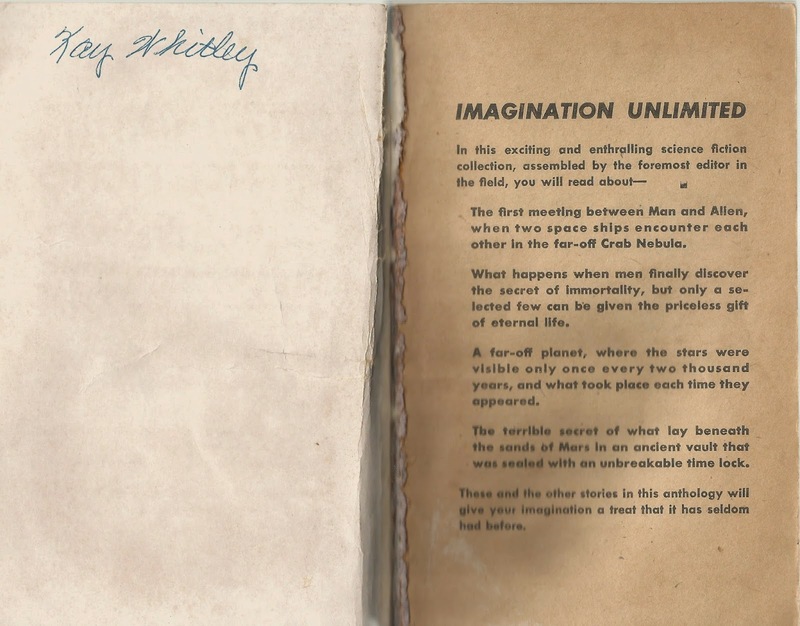 I recently purchased a severely worn copy of Berkely's 1956 paperback edition (G - 41) of The Astounding Science Fiction Anthology. I bought it largely because of the terrific Richard Powers cover, which is full of battling space craft, baroque towers, and mysterious banks of mist. The cover text includes a typo, a misspelling of Lester del Rey's name--maybe this book is worth a billion dollars, like that stamp with the plane upside down? My copy was once owned by a Kay Whitley. Yesterday I read three stories from this crumbling artifact of an earlier world, two by MPorcius Fiction Log faves, and one by an author I've never read before. I've read a lot of Van Vogt in my day, but not this one, which I am told is his first written (but not first published) tale. A shape-shifting Martian creature has stowed away on a Earth space freighter. The creature is on a desperate mission, to find and bring back to Mars the greatest mathematician on Earth! Van Vogt does a great job using this alien as a main character, getting into its psychology, and showing us how it infiltrates Earth society and employs any means necessary to accomplish its goal. It turns out the shape-shifting creature is a kind of robot, created by extra dimensional aliens who need the help of a mathematical genius to open up the colossal prison on Mars in which one of their comrades was imprisoned millions of years ago. The story includes cool SF devices like anti grav and rocket technology, and cool settings, like inside the space ships and an ancient Martian city. There's also esoteric math; did you know that 23,058,430,092,139,351 is a prime number? Me neither! A classic Golden Age story; strongly recommended. Fellow SF fan Kay Whitley, we salute you! This story first appeared in the same issue of Astounding as Theodore Sturgeon's "Killdozer!" Mysteriously, the title heading on page 137 of this anthology reads "When the Bough Bends," though the Table of Contents has "When the Bough Breaks." As with the Van Vogt, I've read lots of things by Kuttner and Moore, but not this one until this week. Kuttner and Moore like to write about people and artifacts from the future that come back to the 19th or 20th centuries and interact with people. Some of their most recognized work, like "Vintage Season" and "Mimsy Were the Borogroves" are along this line, and so is "When the Bough Breaks." Physicist Joe Calderon and his wife Myra have a baby son, Alexander. Four little dwarves with oversized heads begin visiting them to train Alexander--Alexander, his parents are told, is the first specimen of Homo Superior, and is still alive in the year 2450, from whence they have come. When Myra and Joe try to interfere the dwarves use a paralysis ray on them, and try to console them by telling them they are worshiped in the twenty-fifth century. In a month the infant has a bigger vocabulary than his parents and when he wants candy he just teleports mom to and from the store. He develops a cruel and callous sense of humor, and uses his superpowers to play jokes on his parents (shocking them with electricity, for example.) The ending took me by surprise. Because Alexander is invincible it is impossible to discipline him. The dwarves had warned him to be careful with one of the training devices they brought with them from the future, but Alexander ignores their advice and immolates himself. A good story; I like the ending, which says something about the way an individual's superiority can corrupt him (something the baby's name cleverly foreshadows). I also like how the parents' attitude towards their child changes over the course of the story, and the mystery presented by the four deceitful dwarves from the future: are they trying to foster Alexander's development, or laying a trap for him? Do they hope he will found a race of supermen, or are they subtly undermining him because such a superior man will inevitably become a monstrous tyrant? I'd never read anything by Kris Neville before, and one reason I purchased this anthology was to read this story. 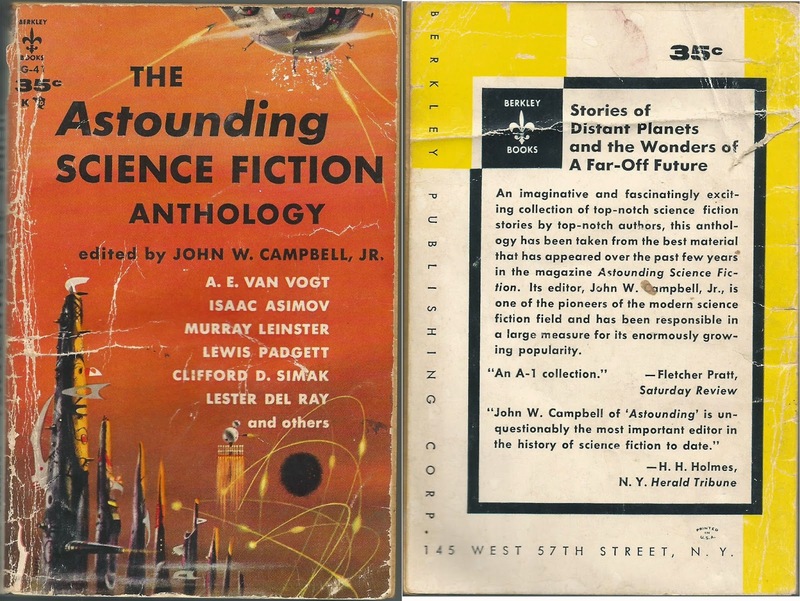 Who is this guy whom John Campbell, Jr, saw fit to include in this anthology along with such famous names as Van Vogt, Asimov, Leinster, Simak and Del Rey? The Wikipedia page on Neville consists mostly of quotes from Barry Malzberg in which Malzberg declares Neville a brilliant genius far superior to other SF writers and in fact too good a writer to waste his time on SF. (Malzberg can lay it on pretty thick when he wants to.) Reading "Cold War" makes it easy to see why Malzberg would admire and identify with Neville--"Cold War" includes some of the themes and tone which characterize Malzberg's own work. In the world depicted in "Cold War" the peace is maintained by American space stations armed with nuclear weapons; should any nation act aggressively against American interests, the space stations can quickly nuke the aggressor. There is a secret about the space stations, however, a secret the President will go to any length to hide. Congressional investigators, and crusading journalists, try to figure out the secret, and the President is not afraid to use the Secret Service to murder such researchers, should they discover the truth. The secret? That no human is psychologically equipped to man the space stations. Being responsible for the lives of millions of people, having the power to obliterate millions of people, is driving the space crews crazy. So far the astronauts have only cracked up upon returning home on leave, but when they do flip they commit horrible crimes. One guy slices up his family with a knife. The President and his closest advisers live in terror, knowing that eventually one of the space station crew members will likely go insane while in orbit and release a station's load of nuclear bombs on Earth, annihilating millions of innocent people. Malzberg's fiction is full of astronauts that go insane, including astronauts who go insane and nuke the Earth from space. It was pretty surprising to see what I thought of as a stereotypical Malzberg scenario in a story published over twenty years before Malzberg's own Falling Astronauts and "Out From Ganymede." I guess there really is nothing new under the sun. "Cold War" is a good story, but its strength lies almost entirely in its surprising idea; it is not a fun story, and the style and characters are totally unremarkable. Three good stories full of cool ideas and human drama that serve as solid examples of how exciting and even subversive (parents who dislike their own kids and presidents who assassinate journalists and congressmen!) Golden Age SF could be. Hopefully some of the other anthologies I purchased during my holiday travels will be as good.